Scania was not initially responsible for rekindling UK interest in gas as a fuel for bus operation but it has monopolised recent sales of buses equipped with the technology since the first examples went into service in April 2013. There are now close to 80 compressed natural gas (CNG) fuelled single deck buses in service with Reading Buses and Stagecoach but Scania has waited until Euro6 before taking the significant step of developing a double deck chassis to increase the options available to operators; hoping to broaden the fuel’s appeal in the process. Building a gas powered double decker is far more challenging than a single decker because you do not have the option to put the gas cylinders, required to store the CNG, on the roof. Last week, Scania invited the press to see the first chassis ‘in the metal’ and hear more about the specification and thinking behind its development, before it was despatched the following day to Falkirk where ADL are to body it using the latest MMC Enviro400 styling. The launch was held at the Leyland premises of mi Vehicle Integration Ltd, successors to the LPD or Leyland Product Development organisation, who have long been responsible for the assembly of Scania double deck chassis for the UK using components and modules supplied from the Scania plant at Södertälje in Sweden. Also participating were ADL who are Scania’s partners in the project and have worked with them to ensure that the bodywork can be mounted as efficiently as it is on their own Enviro400 chassis. Scania’s UK Bus & Coach General Manager Fleet Sales, Mark Oliver, gave the presentation in which he pointed out that Scania had first produced gas powered vehicles almost 100 years ago and in the past couple of decades had sold around 4,000 gas fuelled buses, trucks and engine units, around half of which were buses. There had long been demand for gas in Scandinavia where the nine-litre six-cylinder gas versions of the 3 and 4 series Scania ranges had first been offered in the L chassis. More recently, the five-cylinder nine-litre engine had been adopted as the basis for gas engines. These vehicles were for a wide variety of applications, not just city work, though Mark did not anticipate offering gas solutions for touring work in the short term, primarily because of infrastructure issues. Scania’s gas bus could operate on both liquefied compressed natural gas (LNG) and CNG, whether from the mains or biogas. 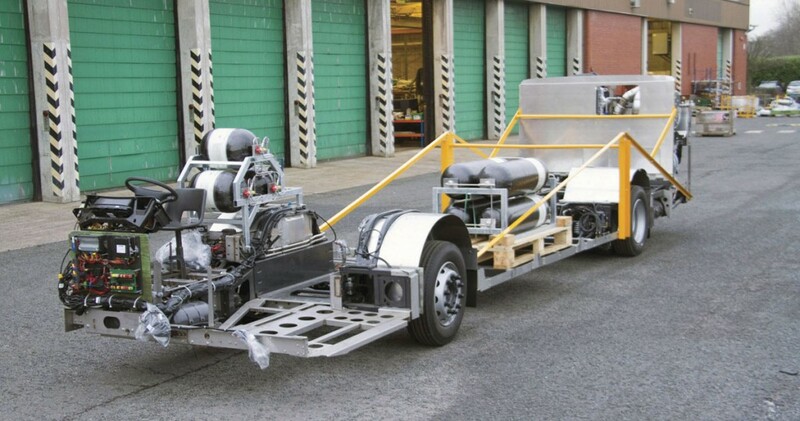 Trucks were being tested in the UK using both LNG and CNG in on-board tanks but it had been decided that on board LNG (which has to be kept at minus 136 degrees centigrade) would not be pursued for UK bus applications. A crucial part of the equation for any operator considering adopting gas fuelling for all or part of a fleet is that of infrastructure, because you can’t run a gas fuelled bus without quite a lot of it. You can’t just pull in at a fuelling station as you can with diesel, not yet anyway, though with fast fill fuelling the process of replenishing the on-bus tanks should be as quick as the diesel refuelling process, taking no more than five minutes to achieve. To provide customers with the expertise necessary to plan, design, install, commission and maintain the equipment necessary to store and deliver gas at a depot, Scania has formed a partnership with the Nottingham based company, Roadgas. An operator does not have to use their services but they can provide a turnkey one stop shop for infrastructure installation and their expertise is such that this should greatly simplify and speed up the process, which can nevertheless take up to a year to accomplish. A difference from the model that had been used previously, whereby the supply of infrastructure was linked to a long term gas supply contract, is that Roadgas do not supply gas themselves, leaving the operator free to source their own supplies in an increasingly competitive open market. An advantage of making Roadgas a partner is that it ensures infrastructure schemes can be funded through Scania’s SGB Finance operation if desired. It is not possible to give a typical cost for installing a gas supply system at a depot because it will be different for every location, depending to a considerable extent on how close the mains gas supply is and how difficult it is to provide a connection to it. Among the factors that have to be considered are the pressure of gas supplies local to an operator. It is also necessary to consider the electrical requirements of the compression pumps needed to take mains gas up to required pressure to adequately fill the tanks on the bus. Another aspect influencing infrastructure provision is the number of gas buses a company wishes to run. Mark said that quotations could be given to customers considering running as few as six or seven new gas buses and in such cases, rather than CNG drawn from the mains it would be LNG (liquified natural gas) that would be supplied, delivered by a tanker that would replenish a storage tank at the depot to be drawn off as required. In the longer term, the option to use LNG meant that there was potential for a second life for CNG buses because using it an operator could conceivably run as few as two or three. It makes no difference to the buses whether the fuel used is supplied as LNG or CNG because LNG is de-liquified to become CNG by the condensing equipment needed at the depot as part of the installation. Based on Scania’s N280 UD4x2EB bus chassis, the engine used is the Euro6 nine-litre, five-cylinder, OC09.101 dedicated gas unit. This develops a maximum of 280hp/206kW at 1,900rpm and peak torque of 1,350Nm at 1,000-1,400rpm. It is fitted with a three-way catalytic converter and a stage one EGR system but, unlike on the diesel version, no SCR system is necessary. Overall the Euro6 gas engine is considerably simpler in mechanical terms than the current generation of diesels. It features software controlled multi-point injection for the first time which gives even gas distribution across each cylinder, controls the emission levels and also ensures that it is less susceptible to variances in gas quality than was previously the case. In maintenance terms the diesel and gas power units are similar with only around 40 parts that are not common across the two versions. Another example Mark pointed out was that gas engine’s turbocharger was a fixed unit rather than featuring variable geometry. As well as the 280hp unit, a 320hp unit delivering 1,500Nm is also available for bus applications. In emissions terms, CNG emits 10-20% less CO2 than a Euro6 diesel, and if biogas is used the reduction rockets to as much as 90% we were told. Only one transmission option is being offered, the six-speed fully automatic ZF Ecolife 6AP1202B unit. As standard, this is equipped with the Topodyn automated gear selection programme which ‘learns’ how a bus can operate most efficiently on a route. The axles employed are the AMA780 unit at the front and the ADA1250 at the rear, with a rear axle ratio of 5.13:1. The technical weights of the axles respectively are 7,100kg and 12,000kg with a design GVW of 19,100kg, though for the time being the limit remains 18,000kg. We were shown the first of the new chassis within the miVI’s workshops. It was complete except for a few very minor items, principally the wiring for the control valves (which was to be fitted before despatch), and was fitted with the steel transport bracing structure used when transferring newly built chassis from Leyland to the bodybuilders. 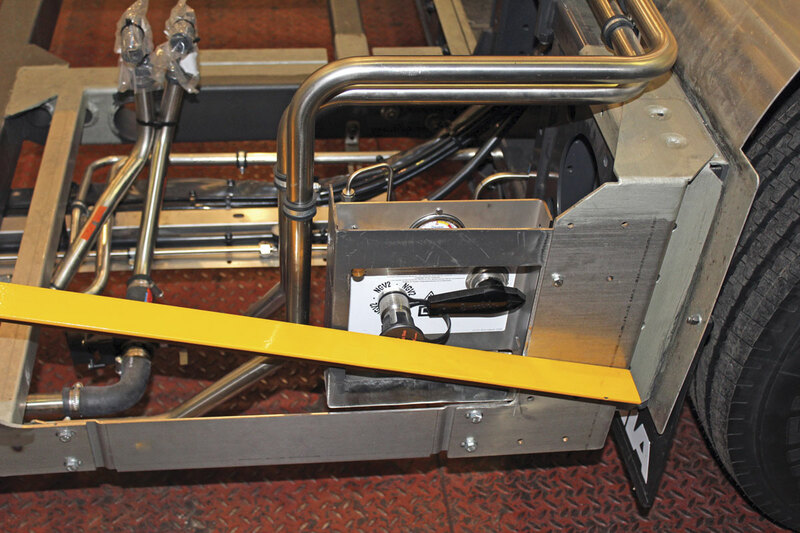 These additional components, identifiable in the accompanying pictures because they are painted bright yellow, give the chassis temporary structural integrity before they gain the rigidity of the body structure. ADL and Scania have worked so closely together on simplifying the process of mounting the MMC body on the Scania chassis that there are now less than 200 differences between the body that goes on a Scania chassis and one that is mounted on an ADL Enviro400 underframe. This equates to less than 5% of components. Whole sections such as the front platform area are identical. 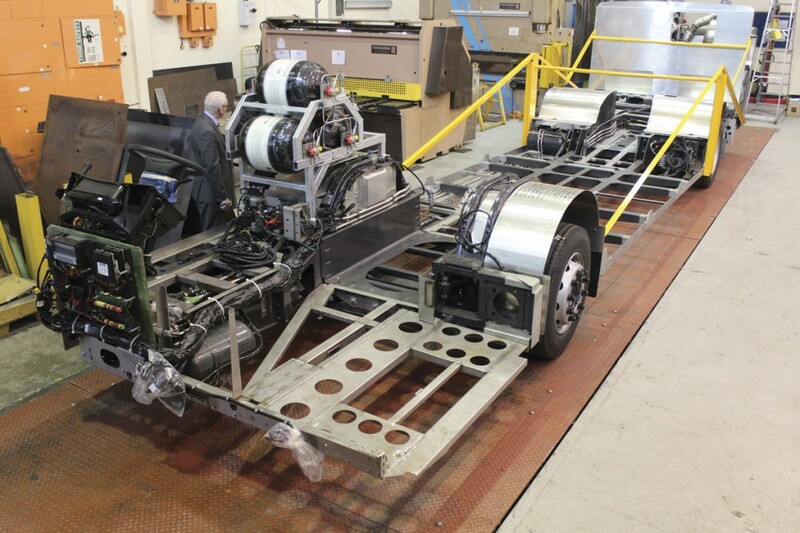 Each manufacturer has learned of the other, an example being that Scania now runs its pipework along in underchassis trays on the offside of the bus, as ADL does on its own chassis. The degree of integration between the products is such that the body of the all-ADL Enviro400 has less than 5% different components than the Scania N250 diesel with Enviro400 body. The first Euro6 diesel Scania has already been completed. I mentioned earlier the difficulty of finding the required space to fit the gas storage cylinders within the structural confines of a double decker and Scania has come up with an ingenious way of limiting the requirement. 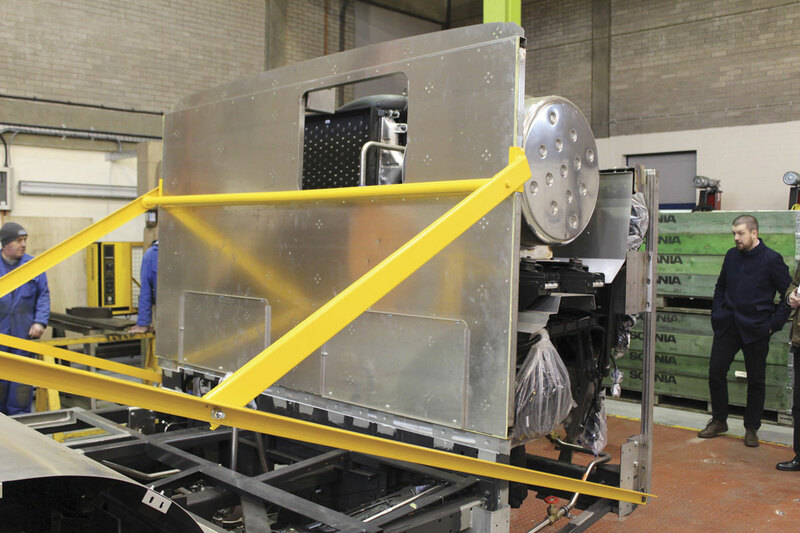 While the single deckers already running, which have eight roof mounted 150-litre tanks giving a total capacity of 1,200 litres run at a pressure of 200 bar, production double deckers will run at the increased pressure of 250 bar reducing the total capacity needed. Mark Oliver told us that the anticipated range of the new buses would be between 300 and 330km. 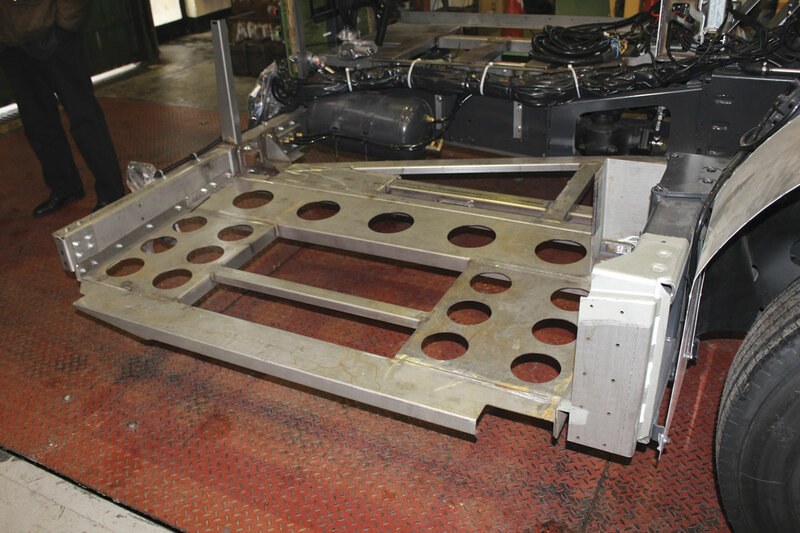 On the chassis we saw, the four rear tanks were rated at 300 bar and therefore capable of running at 250 bar but the front tanks were 200 bar units, as the required certification on higher rated tanks of the size required to fit below the stairs is not yet complete and the company did not want to delay production of the demonstration bus. Scania will either fit uprated tanks when they are ready or run the demonstration bus at 200 bar, which would limit its range to approximately 260-280km. All production buses will have the higher pressure tanks. Mark pointed out that in terms of thermal efficiency, Scania’s Euro6 CNG engines were close to being on a par with diesel units, delivering 40% efficiency compared with the 43% of their diesel. At some points on the torque and power curves, the gas unit outperforms the diesel. The tanks themselves are Worthington Industries units made in Poland. 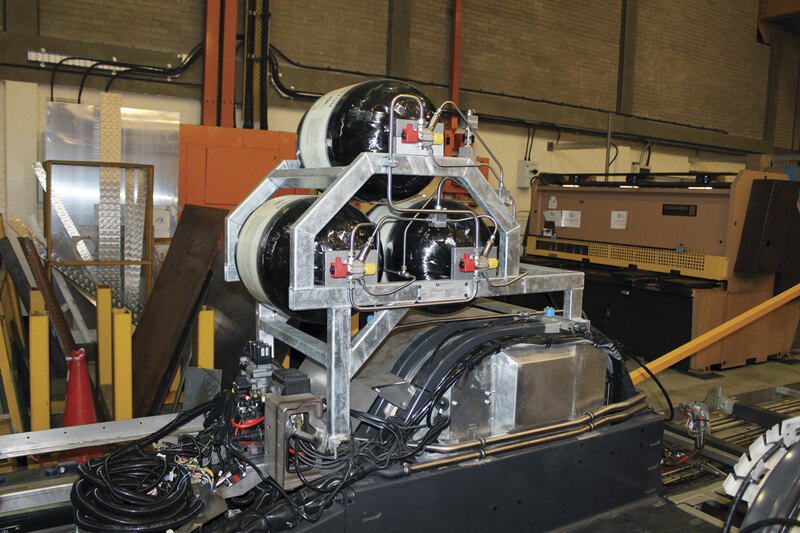 There are two sizes of circular cylinder used, ready mounted within modules that fit directly on to the bus. At the front offside beneath the stairwell there were three shorter length tanks within a triangular module, while alongside the bus, ready to be installed at Falkirk one the body structure above the engine is in place to accept them, are four longer 150kg cylinders. The combined capacity of the front three tanks is 150-litres and 148kg of CNG, while the rear tanks hold 364kg of gas. The double deck tanks are different to those used on Scania’s single deck gas buses which employ French Ulite units. Apparently, it has been found that the capacity of the single deckers is more than is being used and consideration is being given to fitting six or seven rather than eight tanks on future vehicles, though if more range were needed it would be possible to increase the number of tanks to ten, though this would incur a weight penalty. With the extremely high pressures involved, the quality of the piping has to be top quality and technicians have to be additionally certified to work on it. All gas system piping on the Scania gas bus is by Swagelok, including the breathing and venting sections not handling high pressures, and Swagelok undertake the training and certification of maintenance staff. The main gas shut off point is at the offside rear ahead of the bulkhead, with exterior access provided, while the gas filling point is to the rear of the front wheelarch, also on the offside. Measuring 11,440mm long with a 5,895mm wheelbase, the bodied bus will be 4,306mm high, 2,550mm wide and have front and rear overhangs of 2,700mm and 2,845mm respectively. 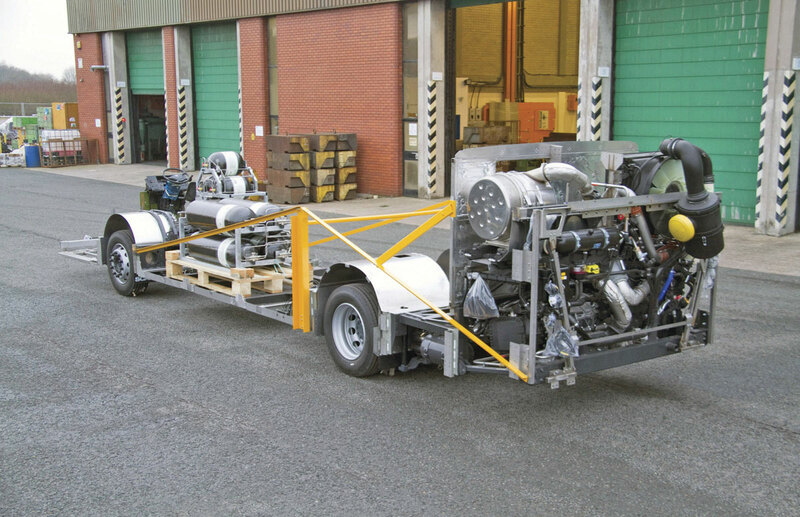 The overall length is 500mm longer than a similar capacity diesel bus (all located within the centre bay) to account for the row of seats lost at the rear of the upper deck by the mounting of the rear gas cylinders above the engine compartment. Using Lazzerini Practico high back seats the upper deck seating capacity is 45 while the lower deck is either 29 seats, no wheelchair and 12 standees or 28 seats, one wheelchair and 11 standees giving a maximum capacity of 86, although 89 is possible. Adding gas cylinders suggests a significant weight penalty but Scania and ADL are confident that an 11.4m gas decker will be only around 300kg heavier than a 10.9m diesel bus of the same seated capacity. Of that figure around 50-60kg will be additional bodywork and the remaining 240-250kg will be a gas penalty. This suggests a loss of around four/five standees but as there is unused capacity within the rear axle limit this may be reduced. As well as developing its gas option, Scania has been working on its new Euro6 diesel double decker, the first example of which has recently been completed at ADL’s Falkirk plant and is currently undergoing testing. Designated the N250UD4x2EB, it is powered by the five-cylinder Scania DC09.111/250 Euro6 unit which develops 250hp. It is now matched to the ZF EcoLife six-speed fully automatic transmission rather than the Ecomat which Scania had continued to offer on its Euro5 diesel deckers. In the recent past, customers have been able to specify double deck bodywork built within the Scania group at the Slupsk facility in Poland, but for Euro6 this is no longer an option and the chassis will only be offered in conjunction with ADL. 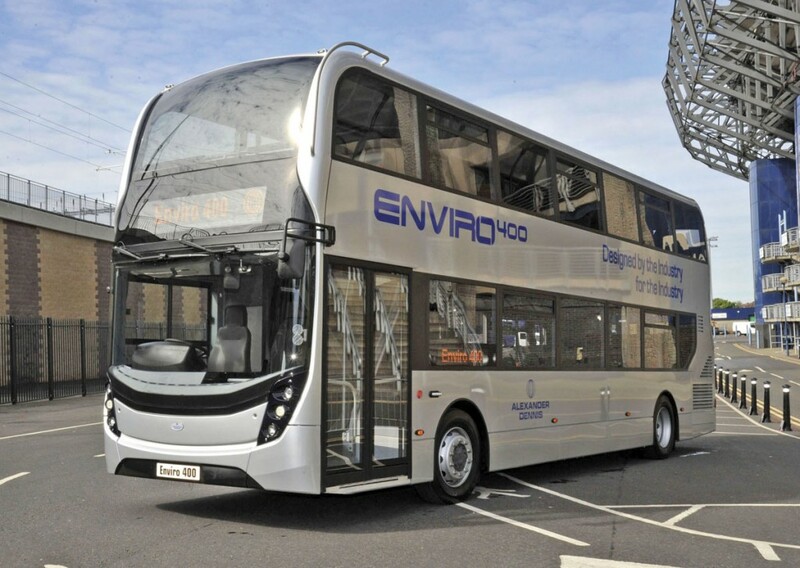 The Enviro400 MMC body is built to a single door provincial specification to the standard 10.9m length and seats 78 passengers, 49 of them on the upper deck and 29 on the lower. Like the CNG version with which it shares the rear lower deck bulkhead, there is no lower deck rear window provided. This will be one of the few ways you will be able to distinguish one from an all ADL Enviro400. As it is to serve as a demonstration bus the interior has been finished in an appropriate manner including E-Leather trimmed seats and painted in a silver livery. 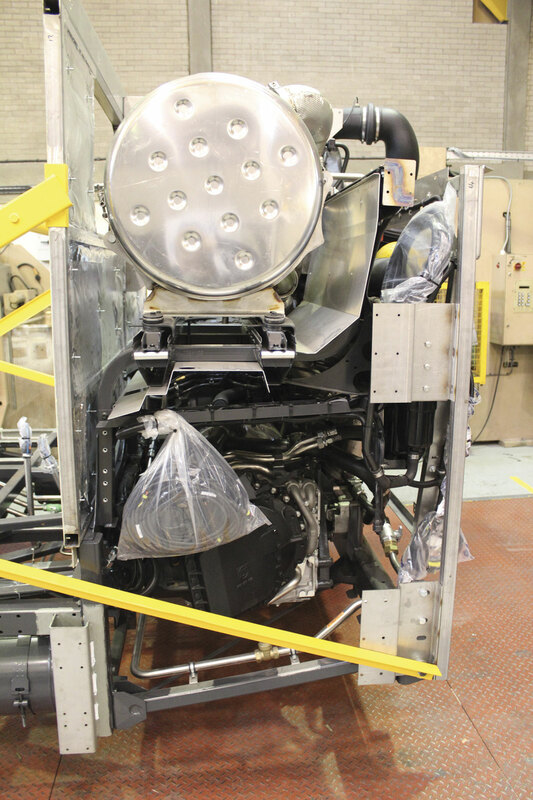 It has already successfully completed the legally required tilt test procedure and will shortly commence a demonstration programme with a number of potential purchasers once testing is complete. 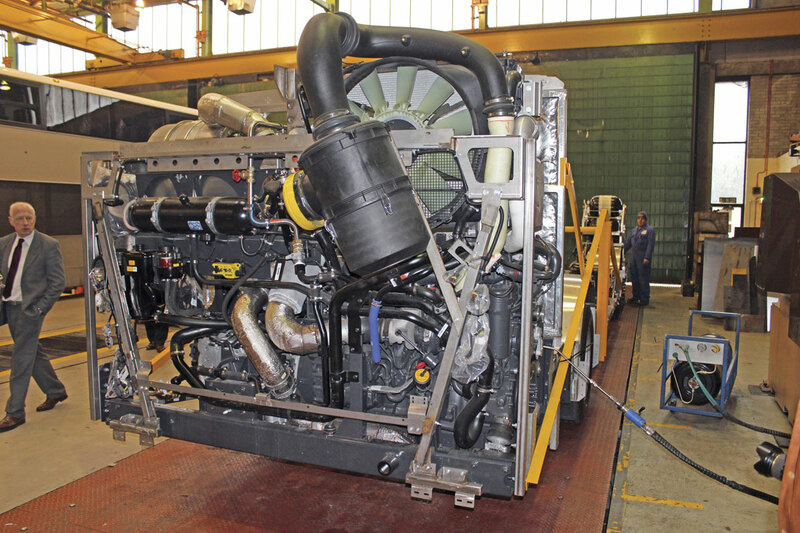 Mark Oliver stressed that mechanically there was very little difference between the Euro5 and Euro6 engine for maintenance staff to take account of, though there were software differences. With the exception of the addition of Scania’s selective catalytic reduction and particulate filter unit, the only physical difference was the different manner of controlling the air intake. Having taken batches of Euro5 Scania double deckers, Stagecoach is the first customer announced for the Euro6 version and these vehicles are in build now. It remains to be seen whether TfL will accept gas fuelled buses in London. It is currently entirely focused on hybrid and electric buses which Mark Oliver confirmed Scania has no plans to introduce. Elsewhere, Scania is experiencing considerable ongoing interest in the gas concept for both single and double deck applications and though no Euro6 orders have yet been placed for the double deck version, quotations are out with nine operators, that could amount to as many as 200 orders in total, if all come to fruition. This figure includes a mix of single and double deck vehicles but the greater demand is thought to be for the decker. A big factor will be the availability of OLEV funding with ‘eight or nine bids’ submitted by various operators, some for double deck or single deck alone, but some calling for both. Mark did not entirely rule out the possibility of some operators buying gas buses on a purely commercial basis without subsidy, as some of the gas buses previously supplied had been. 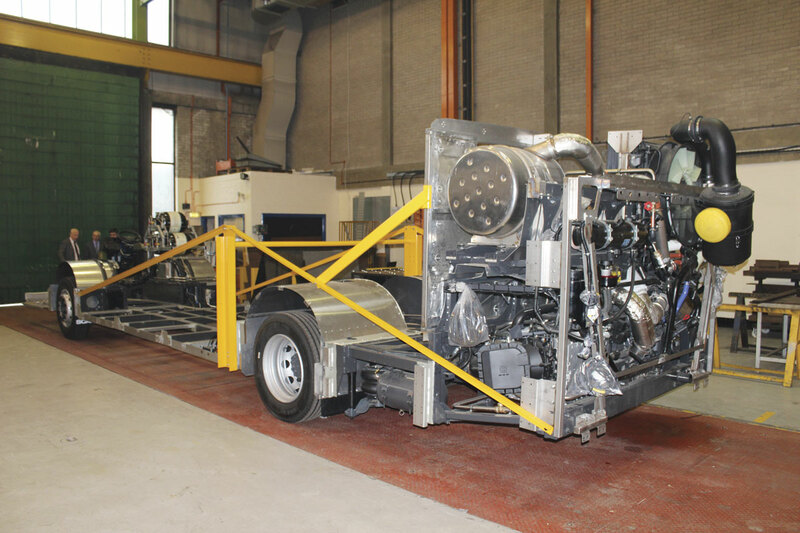 Parts support and technical training was all already available, Scania having trained the technicians at Reading and Stagecoach alongside its own staff. This had been done remotely rather than at the Loughborough training centre. Mark Oliver was pleased that it had been possible to keep the cost premium over a diesel to 15% rather than the 20% that had originally seemed likely. The favourable tax regime with the resulting potential to reduce operating costs, the environmental advantages, the relative ease of maintenance and, with the latest advances, performance that should be much the same as a diesel alternative, there is a great deal to recommend Scania’s gas options, though the cost of installing the necessary infrastructure has always to be weighed up, as do second life issues. Though there are many variables, infrastructure significant among them, Mark talked in terms of a five to seven years payback. We have been promised another look at the vehicle once it has been bodied and tested, which is expected to be some time during May this year. We’ll bring you more news then. Scania are clearly aiming to confront sustainability and although their efforts should be encouraged, they must take a deeper look in to their CNG supply chain as what looks like good news for the environment on the surface can hide the true cost. Various trials have taken place whereby the CNG is supplied from the Gas Bus Alliance however the main source of biogas they use is from a controversial plant (Crouchland Biogas) which was built without necessary planning permits in the rural heart of West Sussex. This plant is subject to several local authority enforcement actions and the conditioning /export of biogas was ruled unlawful. The local community have seen a rural tranquil area spoilt by this unauthorised plant having experienced several major pollution events and are subject to hundreds of HGVs using innappropriate rural lanes. Using a supply from such a controversial plant will not help Scanias cause for the long term. 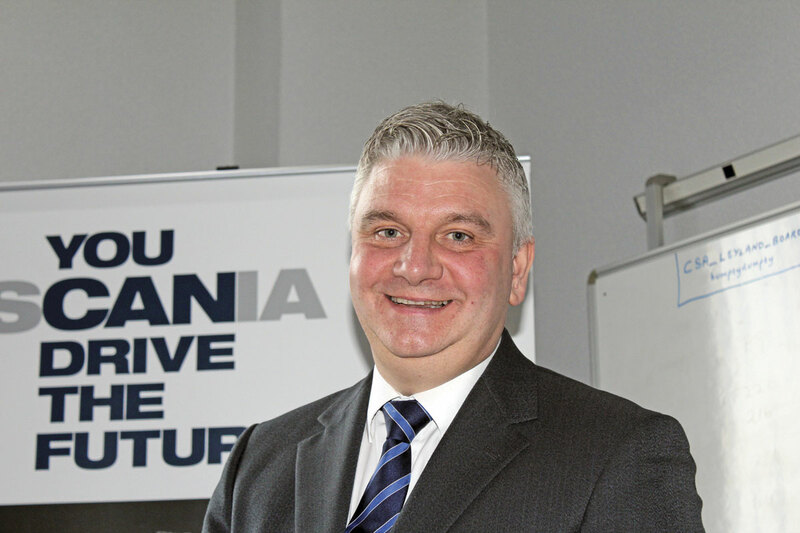 Todays public are better informed than ever and are quick to spot issues like this – It may be that Scania were not aware of the controversy , but that surely means they have to dig deeper in to suppliers and not take things at face value.